Our old Weber Q grill gave up the ghost recently. 😦 It was a good little grill while it lasted. For about 4 years. Don went on the hunt for a replacement on YouTube. (Everything is on YouTube these days!) There are a multitude of videos about the Cobb. As a military couple that relocates frequently, small and portable are important features for us but we didn’t quite know what else we really wanted. Don was overwhelmed fairly quickly by the variety of BBQ and grill products out there. He reached information overload and almost had to just walk away to mull it all over – gas, charcoal, electric, hooded, open, stainless steel, aluminized steel, cast iron…the list goes on! There are BOOKS about what BBQ is right for you. Holy Hannah. We were in over our heads. And then he found the Cobb Grill. Have you ever experienced that ah-ha moment when shopping and you stumble across exactly what you’re looking for, even when you weren’t entirely sure what you wanted? That was our reaction to the Cobb. 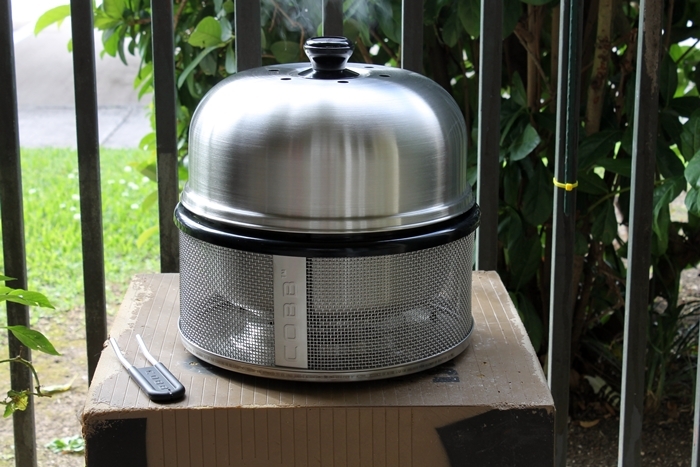 It’s a small, portable, stainless steel, charcoal grill that can barbecue, grill, bake, smoke, boil, or warm your food. Holy crap! We watched a video where campers used it to make dinner, warmed rolls while dinner was plated, then baked dessert while they ate dinner. Click here if you want to learn more about this impressive little unit. We ordered one from Amazon (it’s also available here) and it arrived yesterday. Don could hardly contain his glee. We simply had to grill for dinner. 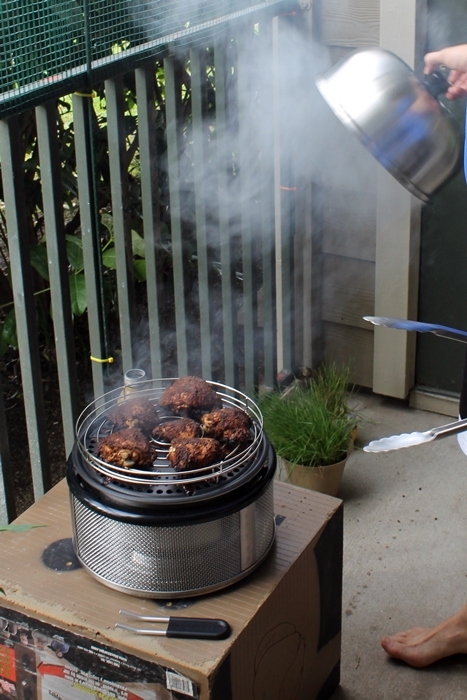 Chicken was the meat of choice with a good coating of our personal recipe for meat rub. We cooked it for about an hour and 45 minutes. Here we are checking it and turning it at the halfway point. 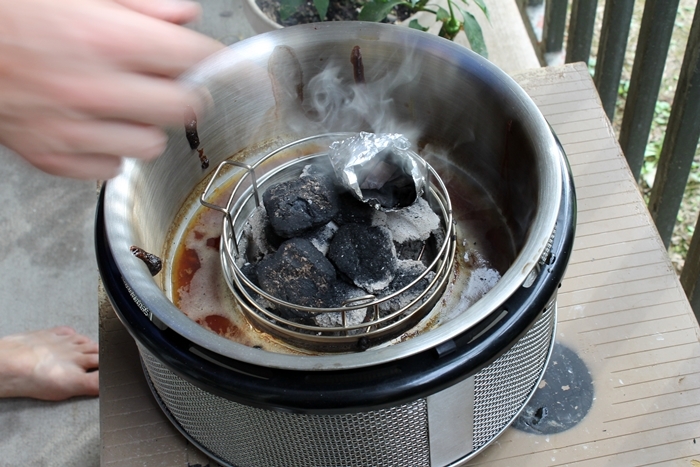 Don also used a bag of applewood chips on the briquettes and added apple juice to the well around the charcoal for added flavors. 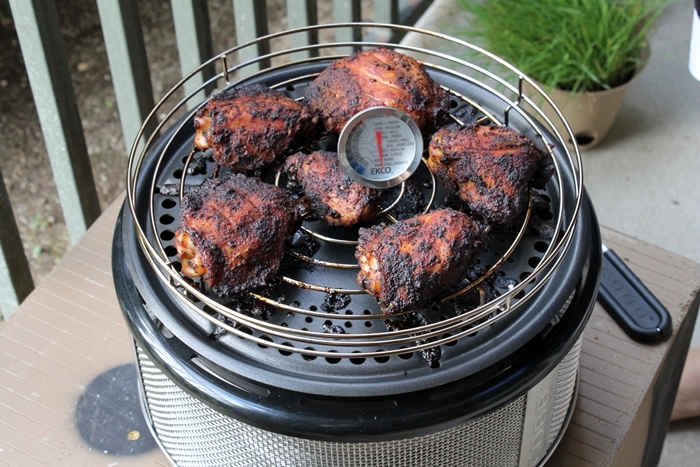 The grill has a nifty handle that allows you to pick up the entire cooking surface to check your heat below, or to add foods that you can cook down below as well. Reminder to all you grillers out there: check your meat temperature! Especially if you are not familiar with your grill. I snapped the shot above before the thermometer registered the temp. Rest assured, it was done! I also made roasted Brussels sprouts with onion and walnuts. OMG. So. Good. I lightly coated them with olive oil and dusted them with salt, pepper, and just a touch of cayenne before placing them in the oven to roast at 400 for about 30-40 minutes. I check and turn them every 10 minutes or so. They do need careful watching. At the 15 minute mark I add the onions. (They tend to get over-roasted if they go in for the full time.) I keep checking and turning. Then maybe 5 minutes before serving, I add the walnuts just to warm them and get a little toasted flavor. 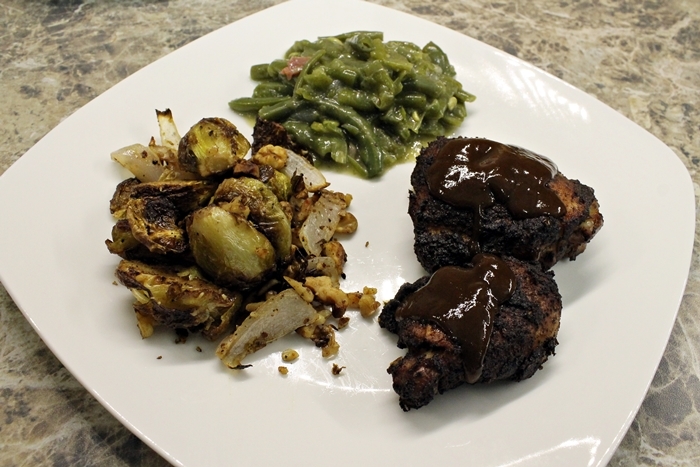 This is a more simple variation on our last post about Brussels sprouts. I like it. Easy and tasty. The cayenne gave it an extra zing that was just right, and I even surprised Don with it. The green beans are not anything fancy. Just green beans warmed on the stove with a little chicken broth, cream of mushroom soup (about half a can), onions, and a little bacon to finish at the end. They’re good. Not amazing but good eats. The chicken. It was good. Don appreciates the smoke flavor more than me. The meat itself was moist, well cooked, and good enough that I finished my plate first. LOL I just think the smoky flavor is going to take some getting used to for me. All in all, a successful first dinner with the Cobb. Hopefully many more to come. 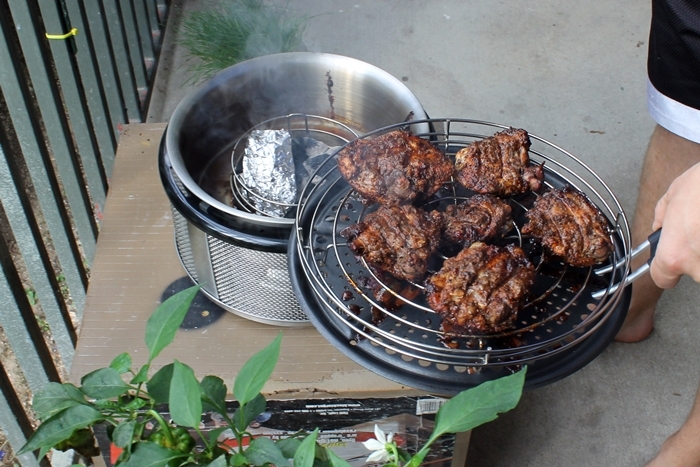 Everybody says, ‘I have problems overcooking steak on the grill,’ but just take it off earlier! Grilling is really common sense. It’s very simple. 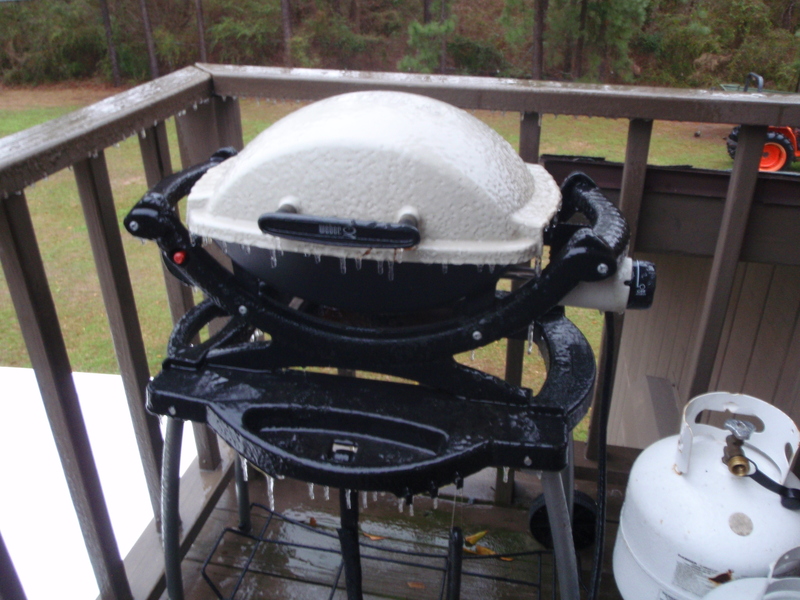 You should think of a grill as a burner – it just happens to have grates. You shouldn’t be intimidated by it. We have 2 new distributors in the US now, the one we were using decided to branch out into other areas, so we were temporarily down, but it’s full steam ahead! Again, thanks for a fabulous write up and we wish you tons of happy Cobbing going forward! 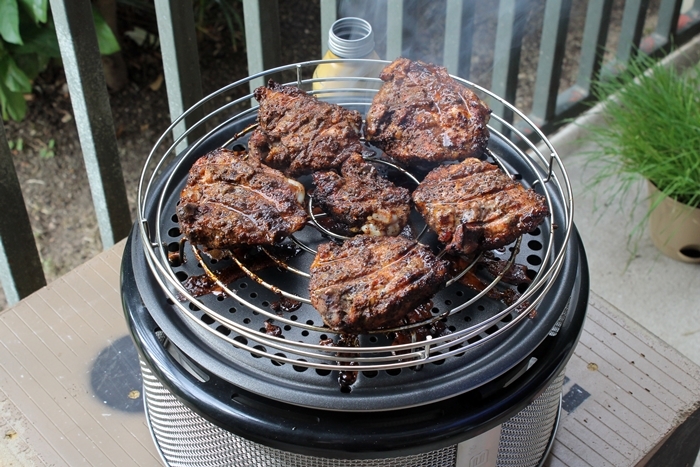 Hello Jessica – this is Cornelia from cobbchefusa.com / cobbgrillamerica.com. Thank you for your enthusiastic review. New and potential customers are always looking for an honest report from other users. Please keep contact – we would love to get to know you better and see what else you can dish up on the Cobb! P.S. Two pieces of wood chips could provide enough ‘smokiness’ for food done on the Cobb as the enclosed design keep all the good flavor and moisture inside.